Cancer not only makes a person physically weak but also makes them emotionally or psychologically weak. Cancer spreads over time and mostly not curable. But during the past decade, there are new discoveries every day in medical science. Many people are suffering from cancer and winning over this deadly disease. While some give up in their battle against cancer. But there are success stories of famous celebrities who are suffering from cancer and still alive and give inspiration to others not to give up so easily. 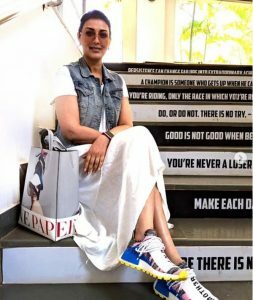 A 40 years old actress, Sonali Bendre suffered from high-grade cancer. She published a note for her fans and friends on twitter. She clearly said in her note that she is a fighter and will take on the disease head-on. An Indian actress from Bollywood, diagnosed with ovarian cancer when she was 42. She left the cinema and Bollywood as soon as she got to know about cancer. After the 3 years of battle in 2015, she was declared cancer-free even she went through a psychological breakdown during the treatment. After that, she joined many NGOs and organizations that support and help cancer patients. Lisa Ray, another beautiful Bollywood actress, diagnosed with a rare type of cancer in 2009. This type of cancer hits white blood cells in the bone marrow. This type of cancer is treatable but not curable. Lisa underwent a stem cell transplant and declared cancer-free in 2010. Though during her treatment she has chosen to keep mum about it she battled it bravely. Beautiful and charming actress of 60s, Mumtaz diagnosed with breast cancer in the year 2000. During her long journey of battle from cancer, she underwent surgeries and treatment. She is now living a cancer-free life. A Bollywood writer and director, also diagnosed with promyelocytic leukemia, a type of blood cancer in 2004. He left all his hopes when the doctor told him that he has only 2-3 months. But he fought bravely for 3 years and now living a cancer-free life. The young Bollywood actress Barbara Mori(The Uruguayan-Mexican model and actress ) diagnosed with cancer in 2010. Luckily, it was a very early stage and she came out of cancer in the same year. A south Indian movies actress diagnosed with breast cancer and struggled bravely. Now she takes part in any cancer-related awareness program and also shares her battle of cancer with people. ⟵How Google Tracks you & Things you must know before deleting your Google account?